You may be looking for Cisco St, a street in Broker, Liberty City in GTA IV. Cisco is a character in the 3D Universe who appears as a main character in Grand Theft Auto Advance. He is the Colombian Cartel leader and based in Shoreside Vale. Due to the technical limitations of the Game Boy Advance, no voice actor was hired to voice Cisco. 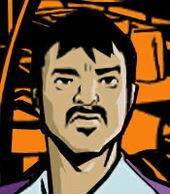 Cisco, born in Colombia, at an unknown time became the leader of the Colombian Cartel and moved to Liberty City, basing himself in Aspatria, Staunton Island, although he is an illegal alien, owning only an identity card from the Mexican government. He also reminisces, in the mission Flying High, about his life in Colombia, where "my word went unchallenged and my debts unpaid!" By 2000, Cisco had heavily invested in actual businesses, used for criminal purposes, such as three shoe shops and a butchers (on Staunton Island) and an airline, presumably based out of Francis International Airport. Cisco also speaks five variations of Spanish and is 'multi-tongued'. Cisco first meets Mike, the protagonist of GTA Advance, when Mike is sent to kill him on orders from King Courtney. Mike, believing Cisco to be responsible for the deaths of his accomplice Vinnie and friend Jonnie, attacks Cisco before forming an alliance, when Cisco informs him he can help locate the real killers, suggesting either the Uptown Yardies (led by King Courtney) or the Yakuza (led by Asuka and Kenji Kasen). Meeting Mike as an ally for the first time, he sends him to deliver shoes to three of his shops on Staunton Island, as they contain secret goods in the heels. When one shop manager, Pat refuses to work on the shoes, Cisco personally kidnaps his dog and kills it, using his butchers to dismember the body and Mike to deliver the remains to Pat. Cisco, satisified with Mike's work, later hires him to blow up a factory manufacturing aerial surveillance equipment for South American governments and kidnap Yuka, the niece of Yakuza co-leader Asuka Kasen. After this, however, Cisco stops hiring Mike, wishing him the best, and uses Yuka to blackmail Asuka into allowing him to do business in certain areas on Staunton Island. Mike later rescues Yuka and returns her to her aunt, who had begun tasked him with her safe return. After this, he moves to Francis International Airport to look closely into the killing of Vinnie for Mike, warning him of a trap designed to kill him, which Mike ignores. Shortly afterwards, Cisco leaves his base to return to Staunton Island to take part in discussions about a bubonic plague outbreak in Liberty City, telling Mike is supporting the call for government research into the matter. He has Mike drive a dangerous route to the meeting, acting as a decoy, allowing him to take a safer route. Mike, while acting as the decoy, is attacked by the Uptown Yardies, the Southside Hoods and the Mafia (most likely the Leone Family). Cisco pages Mike to tell of his safe arrival, but is later killed by Vinnie, who had faked his own death. The Cartel, however, blame Mike and later attempt to kill him, with Mike managing to escape and leave Liberty City. As Mike leaves, he remembers both Cisco and Jonnie, counting them as his only friends from his time in Liberty City. This page was last modified on 8 March 2017, at 17:52.